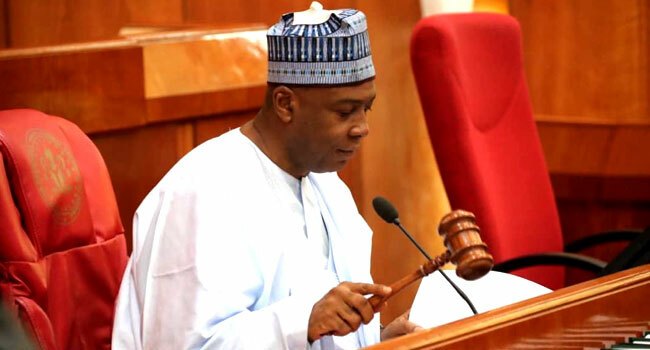 The Senate President, Dr Bukola Saraki, holds a gavel during plenary in Abuja on April 11, 2019. The Senate has confirmed the nomination of three persons as Career Ambassadors-Designate. The lawmakers also approved the appointment of the Chairman and members of the Board of National Bureau of Statistics (NBS) during plenary on Thursday. This followed the presentation of the report of the Committee on Foreign Affairs on the nomination of the career ambassadors-designate by Senator Monsurat Sunmonu from Oyo State. Those whose nominations were confirmed are Mr Christopher Chejina, Mr Bukar Kolo, and Mr M Mabdul. In his remarks, the Senate President, Dr Bukola Saraki, congratulated the new career ambassadors-designate. He also wished them a successful tenure in their service to the nation. Thereafter, Senator Yele Omogunwa from Ondo State laid the report of the Committee on National Planning and Economic Affairs on the nomination of the NBS board chairman and members. After considering the report, the lawmakers confirmed Dr Kabiru Nakaura as the board chairman of the agency. They also approved the appointment of five others as members of the board. Those confirmed include Mr Akinola Bashir, Professor Moses Momoh, Wallijoh Ahijoh, Adam Modu, and Nwafor Chukwudi. The Senate President also congratulated them and wished them a successful tenure.